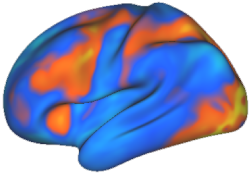 Penfield had shown that motor cortex is organized in a somatotopic map. However, it was unclear how individual neurons are organized. What does each neuron’s activity represent? The final location of a movement, or the direction of that movement? Shwartz & Georgopoulos found that movement direction correlated best with neural activity. Further, they discovered that the neurons use a population code to specify a given movement. Thus, as illustrated above, a single neuron responds to a variety of movement direction but has one preferred direction (PD). The preferred direction code across a large population of neurons thus sums to specify each movement. Schwartz has since demonstrated how these population vectors can be interpreted by a computer to control a prosthetic arm. He has used this to imbue monkeys with Jedi powers; able to move a prosthetic limb in another room (or attached) with only a thought. Using this technology the Schwartz team hopes to allow amputee humans to control artificial limbs as they once did their own. A general computational insight one might take from the Schwartz & Georgopoulos work is the possibility of population coding across cortex. It appears that all perception, semantics, and action may be coded as distributed population vectors. Representational specificity within these vectors likely arises from conjunctions of receptive fields, and are dominated by those receptive fields most specific to each representation. Implication: The mind, largely governed by reward-seeking behavior on a continuum between controlled and automatic processing, is implemented in an electro-chemical organ with distributed and modular function consisting of excitatory and inhibitory neurons communicating via ion-induced action potentials over convergent and divergent synaptic connections altered by timing-dependent correlated activity often driven by expectation errors. The cortex, a part of that organ organized via local competition and composed of functional column units whose spatial dedication determines representational resolution, is composed of many specialized regions involved in perception (e.g., touch: parietal, vision: occipital), action (e.g., frontal), and memory (e.g., short-term: prefrontal, long-term: temporal), which depend on inter-regional connectivity for functional integration, population vector summation for representational specificity, and recurrent connectivity for sequential learning. have you seen this paper? Graziano MSA, Taylor CSR, and Moore T. (2002). Complex movements evoked by microstimulation of precentral cortex. Neuron 34: 841-851. Krauzlis RJ. (2002). Reaching for answers. Neuron 34: 673-674. Yes, I’ve seen this work. I’m a bit skeptical of the results because interpretation of microstimulation results is problematic, and interpretation of microstimulation over an extended period (as was done in the Graziano et al., 2002 study) is even more so. There are likely feedback connections from primary motor cortex to other (higher) motor regions, and extended stimulation likely recruits these regions. Therefore, we cannot be sure that the function of motor cortex is reflected in these stimulation experiments. That commentary by Krauzlis you referenced covers all of these issues. I’m looking forward to seeing if Graziano’s interpretation of his results are valid, given future work.